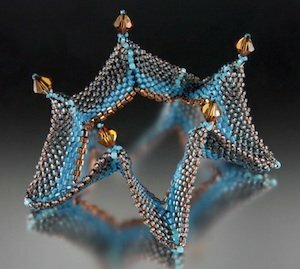 Description: Create a unique bracelet with a fun and fabulous zig-zag design using flat peyote stitch techniques. Explore your inner creativity by taking a standard stitch to a brand new level. Accent your piece with Swarovski crystals for that perfect finishing touch. Everyone will get the point when you embellish your wrist with this eye-catching design.